Like all major products spanning multiple decades, Windows has spawned multiple versions and many advertising efforts. Some good, some bad. The recent "I'm a PC" and "Life without walls" campaigns have been a success while many marketeers would surely argue that 1995's "Start me up" Windows 95 campaign was brilliantly executed. But then, there's always the ones they'd rather you forget about; and we've got plenty of those in this list. Here's the best and worst of Windows ads down through the years. 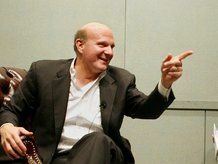 Ballmer obviously thought the best way to sell Windows 1.0 was to have himself shouting at the camera and asking "How much do you think Microsoft Windows is worth?" before finally declaring at the top of his voice "No, its just $99! That's right, $99!" Nobody else did, but everyone was too scared to tell him. It doesn't get much better with this, the bizarre story of an under pressure office worker turning to Windows to get her out of a jam. The original 12 minute promo was sent to retailers, though this is an edit. Sounds innocuous enough? Well, that's until you get to the most bizarre rap in the world. Quite what is going on here is beyond us. It's a Japanese ad, set in a castle and some bloke is shouting "Windows!" all the time. Worth a watch. Once.